Our organization is engaged in offering high quality of Table Fan Coll Winding Machine which is designed in Order to make excellent performance windings for table fans of ranges. The. Table Fan Winding Machines are manufactured by our wall skilled team of experts by using superior quality of raw material. These Table Fan Winding Machines are available in different specifications. Production of table fan coil. The machine can make 6 coils at time. The winding heads are designed as per your stator. The wire Is guided through highly polished ceramic and guides. The main dread given by an 1 hp PMDC 1 phase motor which allows a maximum winding speed of 3500 rpm. The no of tums / winding direction is controlled with a preset microprocessor controller. The machine Is rugged and easy to operate with minimum maintenance. 3. Molds are applicable to different stack height of stators. 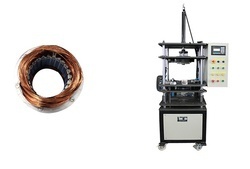 This machine is suitable for forming up the small to medium size stator coil. 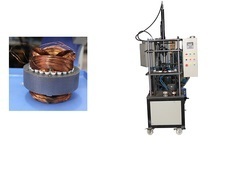 Using upper, lower and center axis molds, this machine can not only rearrange the outlook of tone coil, but also fit the sizing rearrangement, especially suitable for the difficult rearrangement of 2 poles stator. 1. Vertical design minimizes the space requirement. 2. One step operation reduces moving cost. 3. Molds are aplicable to different stack height of stators. Microprocessor in this machine ensures it to be suitable for different kind of lacing function. The tension device to adjust the lacing tension is also equipped. Laced coil in the shape of tortoise shell increases the lacing efficiency. 1. Wide range application is suitable of fan to big stator of air-coinditioner. 2. High lacing speed is up to 220 stitches / min. 3. Neat and uniform bind coil stabilizes quality output and increases product value. The machine is suitable for forming up the small to medium size stator coil. 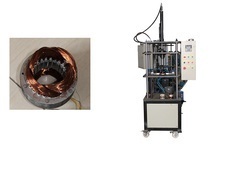 Using upper, lower and center axis molds, this machine can not only rearrange the outlook of tone coil, but also fit the sizing rearrangement, especially suitable for the difficult rearrangement of 2 poles stator. Packaging Details: Fully Packed in wooden box. Packaging charges is extra (2% on machine cost). We are immensely reputed as one of the most prominent manufacturers and suppliers of Table Fan Coil Winding Machine that is used extensively in table fan manufacturing industries. 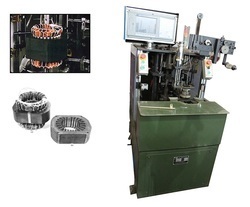 It guides the wire through highly polished ceramics and the winding directions as well as number of turns are controlled by preset microprocessor controller. It is manufactured by using high end technologies. We use the finest grades of basic components and follow rigid norms of quality and offer at leading industry rates to our clients. The main dread given by an 1 hp Single phase motor which allows a maximum winding speed of 5000 RPM. 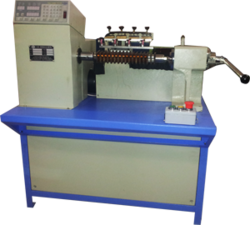 Looking for Coil Winding Machine ?